You don’t need an extravagant budget to brighten up your home and change its outlook from time to time. There are simple solutions out there that work wonderfully to enhance the aesthetics of your home without sucking your purse dry! In this article, we discuss decorative fabrics for curtains, pillows, linen, and furniture upholstery. Among various home décor techniques that work, using fabric is one of the simplest ways in which you can liven up any room in the house so that it truly reflects your personal taste. Fabrics allow you to achieve beautiful patterns and textures, along with the necessary softness and comfort that is needed inside a living space. 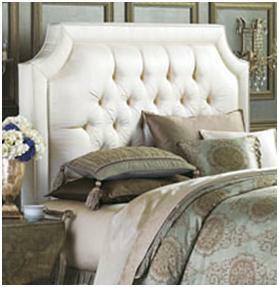 One of the many ways in which fabrics can be used to create a focal point in a room is adding an upholstered headboard. It can be padded and gathered, and exhibit eye-catching patterns like florals. In addition, you can use the same fabric style on other furniture items or drapes (see below) to create a unified look. You can also create a thoroughly unique appearance with creative ideas like a grain sack upholstered headboard. You never know when an upholstered piece of furniture adds the look to your room that you always wanted. Such a piece will be immediately noticeable and will add a visually pleasing variety to make you more comfortable inside your living space. 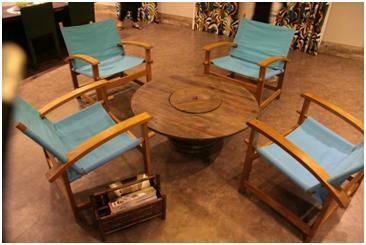 Purchasing furniture is not the only way to create a center of attraction inside a room. You can also use embroidered fabrics for your shades and drapes. If you room has solid colors, go for something that creates more dazzle and offers contrast. On the other hand, you can even make a bold statement by using textiles with an intense hue on your window panels, and then repeat the same colors on your walls. With accented pillows, you will never face the dilemma of being attracted to a bold fabric but not knowing how to blend it into your room. With their endless variety, pillows (and even embroidered pillow covers) can liven up your bedroom, living room, and patio with beautiful shades and patterns to create exquisite textures. You can go for a contrasting trim. Neutrals, of course, help you to layer multiple shades (e.g. tan, blue, charcoal, and taupe), so you can use neutral colors on your accented pillows to go with solid furnishings. In addition, in a room with a lot of white, you can use patterned pillows to add some flamboyance! Another interesting theme is to mix large scale patterns with smaller ones from the same color palette. This results in a harmonized outlook. Ultimately, this is what you have to do. If you don’t experiment and mix several styles, you will never be able to create a personalized look for your home. Where is the fun in that? Thanks for making it easier to choose the designs.